For years, I've had this theory that when a major musical artist disappears for a while, or maybe they no longer record, sometimes another act appears that sounds just like them and gets a hit single out of it. Previously on this blog, I noted the group Flash mimicked prog rockers Yes for their one single "Small Beginnings." Other examples: when Springsteen took years between albums, questionable acts like Billy Falcon, D.B. Byron, and some say Meatloaf stepped into the void. The theory definitely holds true for the English band the Outfield, and their one big hit single "Your Love," which could have been easily mistaken for The Police, who broke up two years before this tune appeared. For a clone song, it is very good and you have to give credit where credit is due. The lead singer sounds almost exactly like a yelping Sting. The instrumentation is sparse and the guitars are heavily chorused, just like The Police. The drums are compressed and gated, just like the Police. The group is British, just like the Police, yet they have a very American name, tagged after a sport that never ever caught on in the UK. You know I like my girls a little bit older. I just wanna use your love tonight. Then the overdubbed background vocals echo "I don't wanna lose your love toni-ight." bass anchoring that mid-tempo beat and the drums miked all over for airy ambiance, pounding like a train engine. The little thing you notice in this song: when the singer goes back to just his voice over a drum this time, the beat pattern changes to a Phil Spector-type "bum...bum-bum" like the kind you hear on the beginning of The Four Seasons' "Rag Doll." Just a cool little touch to keep things interesting in the middle. 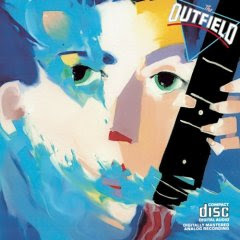 Two albums later, still unable to recapture the heat of "Your Love," the Outfield released Voices of Babylon, produced by David Kahne, which I consider one of the sleeper rock albums of the 80's. Not one hit off this album, unfortunately, but the songs are actually far more consistent than Play Deep, with lots of delays and reverbs moving them slightly more away from The Police sound. Here's the official video of "Your Love," which has an extended intro. nice analysis. hadn't noticed the comparison, but now it's really clear.